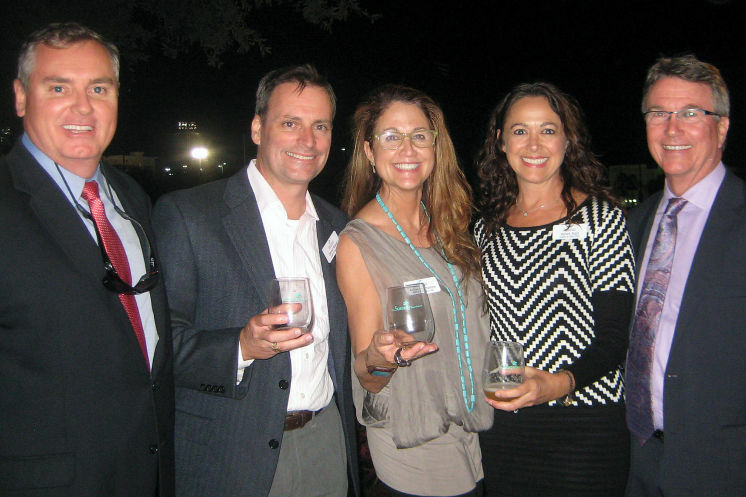 Andrew McIntosh, a founder of the Sustainable Business Coalition, left, and Sustany® Foundation members David Reed, Andrea Cheney and Janet Hall thank supporters like Tampa economic opportunity administrator Bob McDonaugh. Grow and thrive, but protect and sustain. That’s the Sustany® Foundation’s message, served to nearly 1,000 like-minded folks at its seventh annual Sustainable Buzz. Locally sourced, organic, fresh and natural were the buzzwords as 40-plus restaurants, wine stewards and brewmasters converged at the Straz Center on Nov. 13. Urban Juice Co. poured its cold-pressed lineup. Squeeze featured a seasonal pomegranate juice they call Santa’s Little Helper. Maestro’s grilled sustainable amberjack tacos; the Wine Bistro ladled farm-to-table gazpacho; Anise Gastropub curried coconut butternut squash soup. Hydroponic greens enhanced everything made by chef Bryan Gallagher of First We Eat. Generous pours included Two Henry’s blueberry jalapeno beer made with Plant City berries and Barley Mow’s Nipperkin, a dark porter brewed just for the event. St. Pete Distillery dashed cinnamon and nutmeg on its pumpkin spiced rum and mango punch.